Anthony Milotic has worked extensively in Australia and internationally over his long career in hospitality. Always an adventurous spirit, Anthony has spent many years travelling the world – with his equally adventurous wife Elise – exploring destinations, discovering cultures and learning about their culinary traditions. These once-in-a-lifetime experiences have allowed Anthony to hone his cooking skills over the years and produce creative, healthy dishes that he is keen to share with the community. He has spent countless hours researching the best possible foods for humans to be consuming and also methods in preparing these foods. He is passionate about healthy, clean living and is dedicated to sharing his knowledge of food and is determined to ensure he makes a positive impact on the planet. Anthony’s passion for food was instilled in him by his mother from a young age and his father’s determination and strong work ethic have shaped the person he is today. When he is not in the kitchen, you will find him hiking in the Australian bushland or surfing. Candice has been involved in hospitality since the early age of 14 and has been lucky enough to grow up with a family dedicated to holistic health and wellness. Candice has completed her Bachelors Degree in Business Management and is furthering her passion by studying her Masters in Human Resource Management. Candice’s dedication to striving for the best with her self and her team creates a high level of professionalism to deliver the consistency in service that Rough and Bare offers. Candice is also a 4th Dan Black belt in Taekwondo and previous to joining Rough and Bare Candice was the Manager at one of Queensland’s leading health food café’s called Kunara Organic Marketplace located on the Sunshine Coast. Candice was instrumental in leading the team to grow from a single café to one with two successful locations with the addition of a wholesale/manufacturing division supporting many other health food cafes on the coast. With a dedication to the health and wellness Candice is always searching for more information, testing and trialing the latest in trend products and providing inspiration and support to her colleagues. You will know Candice mostly from her infectious and welcoming laugh that fills Rough and Bare with a sense of fun and excitement, putting a smile on both our staff and customers faces every day. 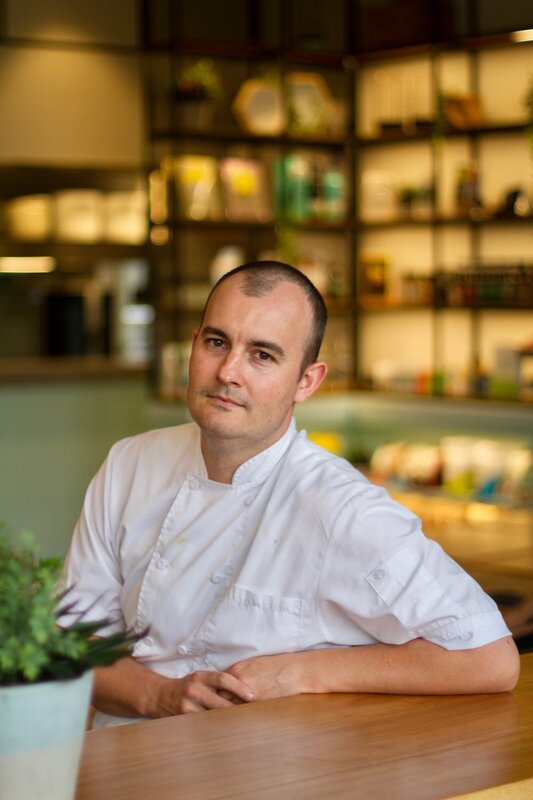 Jamie Miller is the Executive Chef at Rough & Bare Wholefood Kitchen. Jamie began his career in 2002, on Sydney’s Northern Beaches, before moving to London in 2006 where he worked at the West End institution J.Sheeky. It was here Jamie developed a passion for using the best possible seasonal and regional ingredients and really honed his skills as a chef in an extremely busy and popular fine dining restaurant. In 2009, Jamie returned to Australia and began working at Sydney’s Barrenjoey House, where he helped to head up the kitchen under the late celebrity chef Darren Simpson. Since then Jamie has headed up various kitchens across Sydney evolving his own style along the way. Today, having a strong belief in honest, simple and sustainable wholefoods, Jamie is committed to sharing his joy of eating real food, in its purest form, using ingredients sourced from small producers and growers. Helen Padarin is a leading clinical naturopath, nutritionist, presenter, author and an ambassador for the Mindd Foundation. Helen’s clinic is based in Sydney, Australia and she has a team of health care providers helping to reach more people around the globe, empowering them to create real change with their health and their life. She has co-authored 2 books: “The Complete Gut Health Cookbook” with Chef Pete Evans and “BubbaYumYum: The Paleo Way for New Mums, Babies and Toddlers” with Charlotte Carr and Chef Pete Evans and has written a chapter for a highly regarded clinical textbook. Helen is passionate about helping you find the Joy in being well.